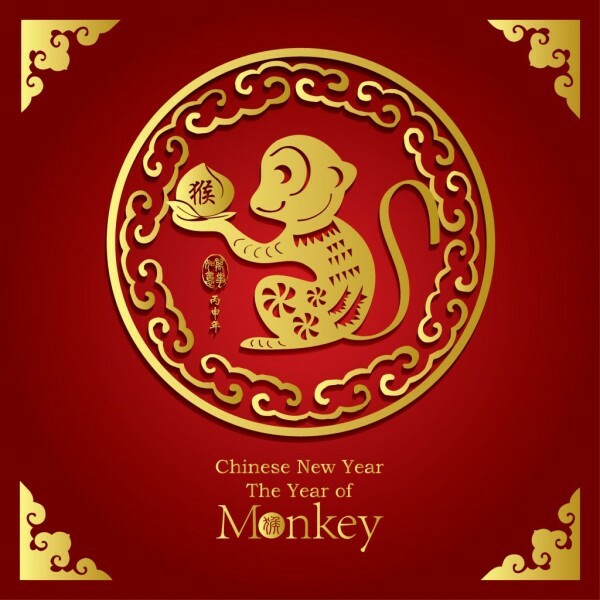 Chinese New Year of the Yang Fire Monkey! The brand New Year of the Fire Monkey begins February 4th, 2016. In Traditional Feng Shui we use the February 4th date to mark the beginning of another Solar Year. It is the beginning of the Tiger Month and is called the “Start of Spring”. The official Chinese New Year celebration occurs on the 2nd new moon following the December 21st Winter Solstice. This year that date is February 8th, 2016. I get many requests for the New Year Updates for each Chinese Animal sign so here are some basic insights for each of you as we leave 2015 and the Year of the Sheep to enter the new energy of the exciting Yang Fire Monkey year. These forecasts relate primarily to the overall relationship of your Chinese Birth Year Animal to the Yang Fire Monkey year energies. * Rats are hardworking and industrious people. You are social, funny and can be perfectionists. 2016 should be a good luck year for career and money. Watch that you do not over work with all your opportunities and be sure to manage your stress with good diet and exercise. You have endured some challenging energies the past two years and are looking at better luck energy in 2016. Family time will be especially enjoyable this year and you may even see a new addition to your family if you have been working on that. All in all 2016 and the Monkey year looks really good for the ever charming Rat! *The Ox is known for his solid dependability. You certainly know how to carry a load and make it to the end of the trail. You are calculating and serious and and very responsible. 2016 will be much better than 2015 but you will still need to work toward your goals and keep your eye on the prize this year. Money luck is good but be careful not to get involved in any risky investments. Romance opportunity is much better this year so keep your heart and your eyes open! Most importantly, stay positive-the reliable Ox can get a bit cranky when down and that will not be the best for attracting that new love interest or business partner in 2016. *Tigers are always brave, expansive, confident, powerful and passionate. All of these qualities make you loved and feared by many. The 2016 Monkey year is directly opposite the beautiful Tiger-so you may feel somewhat restricted in your expansiveness in the coming year. Similar to 2015 you must be careful with what you say and not get into direct confrontations. Be shrewd and patient and don’t show your hand so as not to test your luck this year. Maintain patience and definitely lose any bad habits regarding diet and over indulgence for 2016. It will be a great year to focus on your health and maintaining stability in your business. All Tigers love their freedom so be sure to incorporate small breaks in your routine in 2016 to renew and recharge your enthusiasm. All things in moderation is a great Mantra for the Tigers in 2016 and you will accomplish a lot! One more note-all Tiger people need to be extra careful driving. Absolutely no distractions like texting or emailing. This is your weak point for 2016 Monkey year. * Rabbits are gentle, charming, elegant, private and often very intellectual. You love your homes and it is a lucky person indeed who gets invited to your private inner space. 2016 looks good for Rabbit luck as long as you watch for betrayals in business and nip them in the bud. 2016 is a pretty good year for Rabbits as long as they keep their eyes open and properly manage their business and personal relationships. Although you can be quiet and understated-Rabbits are extremely loyal and value that trait in their friends. Once their trust is lost it is very difficult to get it back indeed. You love your privacy and sometimes tend to retreat to a more serene existence-however- you must stay on top of things in 2106 and you will do fine. *Dragons are so popular and outgoing and love to be the life of the party! You are confident, love attention, and highly self-sufficient. You have an independent nature -so much so-that many Dragons will not even marry and stay single throughout their lives. This does not denote a lack of admirers because Dragons have tons! Dragons do not like to be disagreed with and you do not take kindly to opposition. 2016 will bring you an opportunity to understand the importance of team work and compromise. It will be crucial in 2016 for you to be flexible and not self-important as the Monkey year will require you to be humble and polite to reach success. 2016 will be a good year for improving your relationships in business and in your personal life by learning new skills. *Snakes are so smart! You are always planning and looking for ways to utilize their many skills! You are deep thinkers and much more intuitive than people realize. Listen to your hunches in 2016 because they will bring you career and money luck. As your Social life will bring you opportunities in 2106 be sure to get involved in Charity or volunteer work. You will meet a lot of great people and increase and expand your networks. Health is good but exercise in moderation in 2016. * Horses love to travel, are known for their opinions and adore their freedom. You love winning and take failures and set backs very deeply. You are good with money and will probably spend some of it on far off places. You are great dressers and garnish a great deal of romantic attention because you are so attractive. 2016 will find your creativity high and there will be many opportunities for advancement and success. Your passionate nature will have the energy it needs in 2016 just be sure not to wear yourself out. Emotions will be high so be sure to balance out your exciting year with time to meditate and recharge your energy batteries. * Sheep are very sensitive, very smart and very compassionate people. After a powerful 2015 you are now ready to utilize all you learned and exhale from all the energy directed at you all last year. 2016 will be a year of better earnings and profits and it will feel good to not be on the hot seat like last year! You are known for your empathy and goodness of heart-but one should never mistake your kindness for weakness-or your generosity for granted. No one cares more for the poor than the sensitive and deeply loving Sheep. 2016 is a good luck year and will feel like a breath of fresh air compared to 2015. Wise and confident you will approach each challenge with your usual brilliance and skill and come out, as you always do, on top! 2016 is your Monkey year and there is no chance of getting bored I assure you! In fact you will most likely be traveling and extremely busy with career opportunities and your social sphere. Many Monkeys will get married and some even divorced in 2016 -so take good care of all your relationships in the coming year. You are gifted with a great memory and can be counted on in the most difficult of situations to provide support and solutions. 2016 will be about hard work, consistent behavior and maintaining all that you achieved in 2015. Stress will definitely be your companion so eat right, sleep well, maintain a sense of balance and be sure to book some down time. It is going to be a very busy year- but being a Monkey , you would not have it any other way! Enjoy the ride! * Roosters are such beautiful people! You are organized,colorful, intelligent and even flamboyant. You are ambitious and love to socialize-especially if the network is good for your business at the same time! You are good with money and known for speaking your mind! Emotional and caring you are wonderful friends and deserve the support you give so generously to others. 2016 will find you focusing on financial issues and getting your ducks in a row. 2017 is the Year of the Rooster and you will want to be smart and get your affairs running smoothly during 2016. Yoga, meditation and relaxation will be important to maintain your balance in 2016. Keep healthy, lose weight and get into your fighting shape in preparation for all that life has in store for the coming 24 months. Family will be a priority in 2016 and it will be important to get your personal life on track prior to 2017 when you will be incredibly busy. Roosters crow loudly and sometimes say things they might regret. However, no one can resist their charm and exuberance. You are loving friends and devoted to your family. 2016 is about your personal affairs-and if anyone can organize it all -it is you! 2016 Monkey energy is compatible with the Dog. relationship building will be a key aspect of this year and you may even meet a romantic interest at one of your networking events. health is good just do not take risks with any dangerous sports. New horizons are on the way for the loyal and responsible Dog. 2016 could bring more travel and with it more expenses so it will be good to keep on eye on your budget. * Pigs are the nicest and most honest of all the Chinese Animal signs. You are kind and understanding and a natural born peacemaker. You know all the best people and the best restaurants as Pigs adore the finer things in life. Service is key to your happiness and you are great fundraisers and charity volunteers. 2016 will be a good year for your love life! There is a high potential for finding long lasting romance this year. your home will be a real source of enjoyment in 2016. Also, a hobby could become a new source of income. Because you love the finer things in life this could be a great opportunity to supplement your income. Health is good in 2016-although take care of any chest cold or cough that it does not become a problem this year. All in all a nice year for the Pig! Please remember these are very basic forecasts. Focusing on your goals and remaining positive and strong will make the coming New year of the Monkey the very best year yet! For a more detailed forecast feel free to write me at dee@wellnessdecor.com and as always I love your comments! I really appreciate your post on the 2016 Year of The Monkey. So informative and packed with insight. Something for everyone! I’m going to share this with everyone!